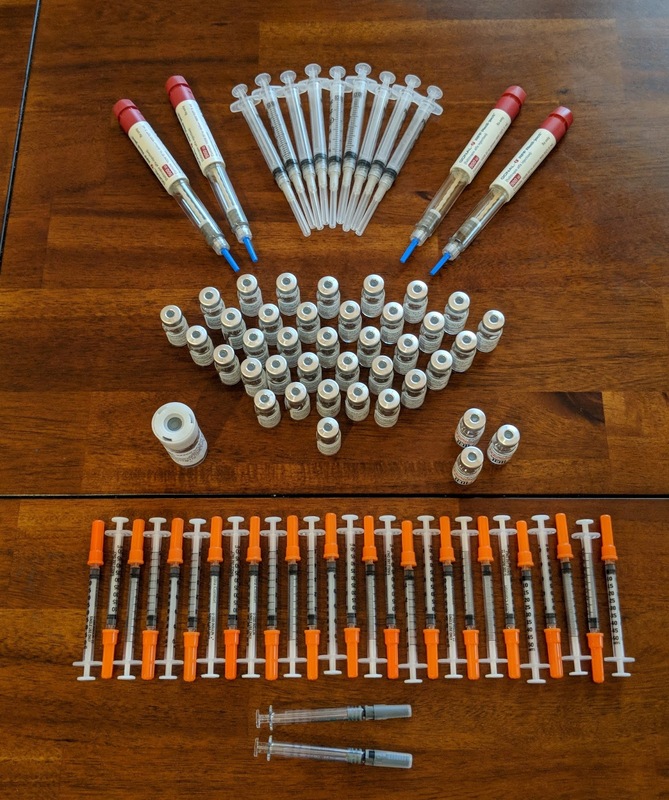 21 days of androgen (testosterone) gel, 21 days of birth control, 21 days of estrace (estrogen), 47 injections over 10 days. 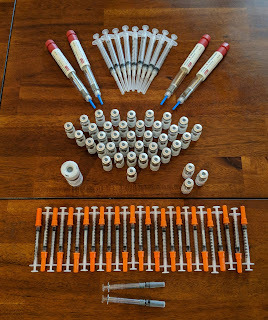 10,800 IU of Menopur, 10,800 IU of Gonal-f, 380 units of Lupron, 2 mL of Omnitrope, and 1 mL of Ovidrel. One egg retrieval, 7 eggs – all of which fertilized, 2 embryos became blasts, and zero were normal. IVF Round 2 was another big fat fail. We went into it with so much hope, as our doctor changed our protocol to an aggressive one. But in the end, we had the exact same result as last time. We’re disappointed, and feel pretty defeated. We have now had 6 abnormal embryos (2 through pregnancy losses, 4 through IVF) and each one has been a different chromosomal abnormality. Our first pregnancy loss was ectopic, so we have no way of knowing whether that was a normal embryo, our second was a male triploidy (it had 3 of each chromosome), the third was a male trisomy 11. With the IVF embryos, they’ve been: male trisomy 4, female monosomy 13, and the last two were both male, trisomy 16 and monosomy 22. All different. So it’s hard to pinpoint what the issue is, other than egg and sperm quality. If the chromosome abnormalities were the same on any of those, it would at least point us in the direction of an issue. Note: Each embryo should have 23 pairs of chromosomes (46 total). Trisomy means it has an extra chromosome, monosomy means it is missing a chromosome. The number refers to the chromosome pair that’s deficient. We met with our doctor last week. Unfortunately, there’s no black and white “here’s what we should do next” answer (which is why it’s taken me several days to write this blog.) I asked for more testing. There’s really not any more testing that we can do on me that hasn’t be done already and would show why we’re having these issues. There’s one test that we can do on Reid that may or may not give us answers. So we will grasp at that straw. Reid will be going to see a urologist, who will do a DNA fragmentation test. This will help us see, hopefully, whether the genetic constitution of Reid's sperm is normal. The reason I say “may or may not give us answers” and “hopefully” is because there is a huge margin for this test. I’ll share more once we meet with the urologist, because right now we just know some basic information about the test. So that’s our next step. We’ve talked over the last couple of days about what to do next. It seems crazy to do another cycle of IVF, given our results from the last two, right? Yeah, well then consider us crazy. We just don’t feel like it’s time to give up yet. But doing the same exact protocol and not changing anything in our prep would be really crazy. So I read the book, It Starts with the Egg, which focuses on egg quality. There are several things that can be done to improve egg and sperm quality, which I think is our issue. We’re working on eliminating toxins in our home (through products that we use every day), and eating even healthier. We’ll spend the next 3-4 months focusing on that and saving money. And then we’ll go another round with a slightly different protocol, and pray for great results. The good thing is we were able to almost double the number of eggs retrieved with the last round, so that’s progress. I know it may seem like we’re spinning our wheels, and I know it may be easy to say “why don’t they just adopt? Why put your body through that again?” Those are easy things to think and say from the outside looking in. From the inside, it’s not so cut and dry. We would like to exhaust every option of having a baby with our DNA, a baby that I can carry to term. We’re not against adoption, and may end up there one day. But not yet. Honestly, I don’t even know that adoption would be an option for us right now given Reid’s health and the possibility of having to move to Indianapolis temporarily, as well as the major financial commitment required for adoption. So that’s where we are right now. Our next deadline has been set, and we’re doing the things that are in our power to better our chances. We’re sad, disappointed, and bitter that the second round didn’t work. But we’re doing our best to focus on the things that we have a little control over. And keep pushing forward. P.S. Our protocol for round 2 can be found here.